Now we turn our attention to the physical circuitry and electrical quantities that are used to represent and operate on the binary codes 1 and 0. 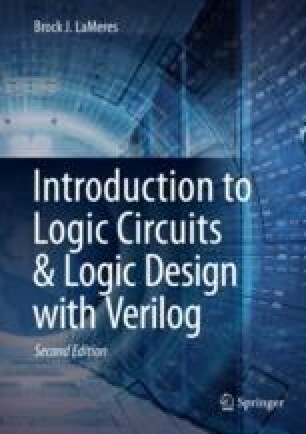 In this chapter we begin by looking at how logic circuits are described and introduce the basic set of gates used for all digital logic operations. We then look at the underlying circuitry that implements the basic gates including digital signaling and how voltages are used to represent 1’s and 0’s. We then look at interfacing between two digital circuits and how to ensure that when one circuit sends a binary code, the receiving circuit is able to determine which code was sent. Logic families are then introduced, and the details of how basic gates are implemented at the switch level are presented. Finally, interfacing considerations are covered for the most common types of digital loads (i.e., other gates, resistors, and LEDs). The goal of this chapter is to provide an understanding of the basic electrical operation of digital circuits.